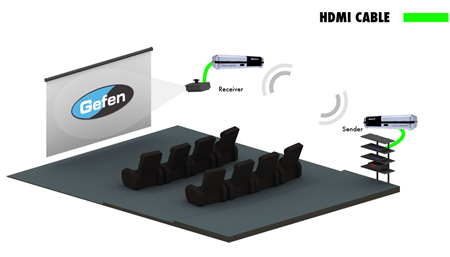 The Gefen GTV-WIRELESSHD is a GefenTV Wireless for HDMI 60 GHz. It extends HDMI at 1080p/60 Hz up to 10 meters (30 feet) away. The Wireless for HDMI 60 GHz Extender extends high-quality uncompressed HDMI 1.3 audio/video at resolutions of up to 1080p/60 Hz to any remote display location up to 30 feet away without the hassle of wires. The Wireless for HDMI 60 GHz Extender employs advanced high-frequency radio technology to support the high multi-gigabit data transfer rates of HDMI 1.3 with 8-channel digital audio. This product is fully HDMI and HDCP Compliant. It conforms to the WiHD CTS International Standard. "WiHD" and the "WiHD" logo are trademarks licensed for use by WirelessHD, LLC. For optimal quality HDMI signal transmission, we recommend installing the Wireless for HDMI 60 GHz Sender and Receiver units in a horizontally level, line-of-sight orientation in open space without tightly enclosing walls or ceilings. Tightly enclosed spaces such as cabinets will block the radio signal and significantly reduce the range. Obstructions in the radio wave path by furniture and other similarly sized objects should be avoided. Maximum Audio Bandwidth 8-channel, 24-bit / 192kHz LPCM.